Windows 95 turns 20 years old today, and for Microsoft it’s more than just ancient history. The launch of Windows 10 last month has plenty of parallels to the operating system Microsoft released a couple decades ago. If you can look past the massive gap in capabilities (Windows 95 PCs required a 386DX processor, 4MB of RAM, and 55MB of free space), Windows 10 arguably has more in common with Windows 95 than any version that has preceded it. 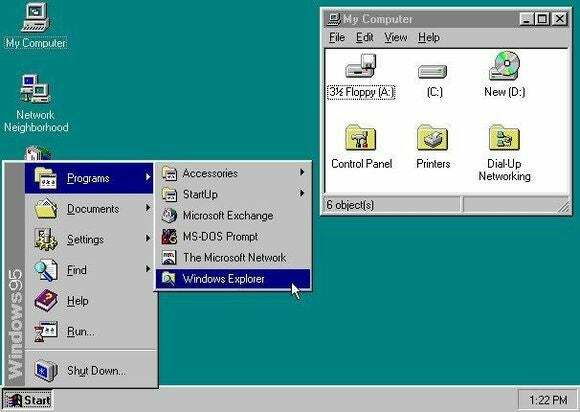 Windows 95 was the first version to include a Start menu, its creation led by a behavioral psychologist whose job was to make Windows easier to use. Microsoft was so enthralled with this invention that based its entire marketing campaign around it, with the Rolling Stones’ “Start Me Up” featuring in TV commercials. Although Microsoft tried to demolish the Start menu in Windows 8, replacing it with a full-screen app launcher, in Windows 10 the Start menu is once again front-and-center. Microsoft entered the browser wars in Windows 95 with the first release of Internet Explorer. Within a few years, it had overtaken Netscape as the most widely-used web browser. Over the last 20 years, competition from Google Chrome and Mozilla Firefox has eroded IE’s lead, and now the Microsoft is starting over with the Edge browser. Windows 95 was a huge leap forward for multitasking, thanks to its taskbar that let users quickly switch between programs. Microsoft didn’t do much to mess with the concept in the years that followed, but Windows 10 brings another big leap: The new Virtual Desktops feature lets users quickly swap not just between apps, but between entire sets of programs and windows. In Windows 10, Internet communications are woven into the fabric of the operating system (for better or worse). Clicking the Start menu shows Live Tiles with glanceable details on the weather, calendar appointments, and new headlines. Instead of opening a browser to search the web, you can just summon Cortana from the taskbar. OneDrive integration lets you share files with a couple of clicks, and the built-in Xbox app lets you keep an eye on what your gaming pals have been up to. Despite all these similarities, the big question remains whether Windows 10 has any chance of being as beloved as Windows 95 was. Microsoft CEO Satya Nadella has at least talked about wanting people to love Windows instead of merely tolerating it. As Windows 95 turns 20, perhaps drawing heavily from its playbook isn’t such a bad idea.